Tila Tequila penned an open letter criticizing the policy of “Don’t Ask, Don’t Tell” (addressed, like her Twitter updates, to “everyone”), intended for the eyes of President Obama, which was posted on Global Grind this week. In the piece, she details the journey of amazian Dan Choi, whose public profile has skyrocketed since he came out in defiance of the policy–and as a result, was booted from the military. Being an openly bisexual woman myself and having a lot of close gay friends, I have always HATED that policy, which pretty much tells people that in order to serve our country, you have to live in secret. We get it. And we laud her efforts, but we can’t help but think she’s missing the point a bit. See, being bisexual and having gay friends isn’t the reason to hate the “Don’t Ask, Don’t Tell” policy. “Don’t Ask, Don’t Tell” is unfair and wrong. EVERYONE should hate this policy, regardless of their personal perspective on sexuality. End of story. 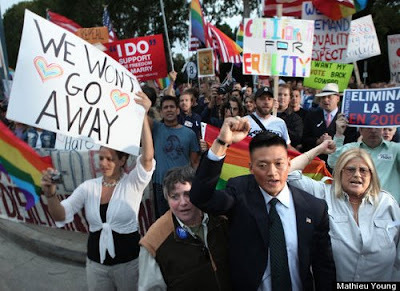 To protest Lt. Dan Choi’s firing and to ask President Obama to keep his promise to repeal “Don’t Ask, Don’t Tell,” click here.